What the rich are doing." One of the things that many enterprising new American filmmakers discovered in the 80s and 90s is that talk is cheap – if your script is smart enough then you can limit your locations and all but dispense with action, and the budget will fall accordingly. It's a lesson learned by the likes of Kevin Smith with Clerks, Doug Liman and Jon Favreau with Swingers, and even that Quentin Tarantino bloke, whose first two movies are still remembered as much for their dialogue as for their hip soundtracks and comparatively short blasts of violence. These films also tend to draw on the direct experiences of the writer/director, in the process capturing something of the genuine wit and sparkle that can be found in everyday speech, only without the boring bits between. Even Tarantino, a one-time video store clerk who clearly dreamed of being movie cool and tough, drew on the personal for his memorable incidental chatter. 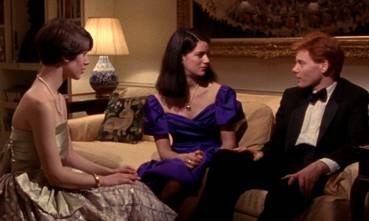 And so we come to Whit Stillman, whose own attitudes to the New York 'preppies' – the young inherently wealthy – and their debutant balls was transformed when he got to hang out with some of them, during which time he got to know and to like them. 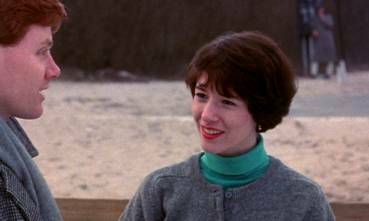 Not a complete novice to the movie world, he believed there was a potential market for a low budget, dialogue-driven comedy-drama based around the New York preppy scene, and the very idea that it might have trouble finding an audience or even a distributor seems to have either not concerned or occurred to him. The premise is straightforward enough. Poor, east-side Tom by chance lands in a cab with three well-to-do preppies, who invite him to join them and their group – known as the Sally Fowler Rat Pack – for the evening. His is befriended by the sneeringly judgemental Nick, adored by the sweetly innocent Audrey, and regarded with some suspicion by the humourlessly intense Charlie. 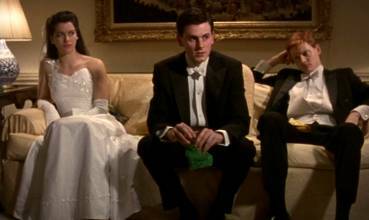 Initially opposed to the whole debutante scene on principal, his social life soon revolves around the group and its members, but his on-off relationship with the flirty Serena leaves him blind to Audrey's attraction to him. Essentially a chamber piece constructed from a series of short vignettes, the delight of the film lies in the dialogue and performances – both are a tad artificial, but in a way that perfectly suits the constructed formality of the settings. We join discussions that are already under way and that frequently come to a premature conclusion as a point is made and the listener pauses to consider what they have heard, a disarming technique that suggests the characters are open to each other's opinions, and one that moves us rapidly through a whole range of viewpoints and theorising. It is this very approach, plus the quality of the writing, that prevents even the group's behaviour and critical discussions of each other from descending into anything approaching soap opera. At first engagingly free-roaming, the conversations not only shape the plot but very subtly define the bonds that exist within the group, which prove stronger than some surface disagreements suggest. Nick in particular snipes at just about everyone, particularly annoying Charlie when he mockingly congratulates him on the creation of a new acronym for their class in UHB, or 'urban haute bourgeoisie'. * "The term is brilliant!" he says with overdone enthusiasm, "And long overdue. It's a bit of a mouthful, isn't it, UHB? Wouldn't it be better to pronounce it simply 'ub'?" Charlie bristles at this apparent sarcasm, but later Nick is freely and sincerely using the term UHB, while Charlie follows Nick's suggestion and pronounces acronym as a half-formed word. Nick's later departure from the narrative is seen as a sadly significant moment, and when presented with a particularly tricky decision, both Charlie and Tom wonder what Nick would do in their situation. The dramatic and character arcs are familiar enough but are handled with an almost sleight-of-hand deftness. This is particularly evident in Charlie's attitude to Tom, his initial hostility fired both by Audrey's attraction to this outsider and the insensitivity with which she is treated by him. Later it's their shared concern for Audrey's well-being that unites the two, the culmination of a gradual change in both that has unexpectedly casts them as the last bastion of their particular branch of the UHB. Whatever they may represent in the social structure, the gradual disintegration of the group proves a surprisingly touching development and one that is all to easy to empathise with – the party is finally over and it's time for everyone to go their separate ways and return to the real world, whatever that may actually consist of. So engaging are the characters, the dialogue and the gentle approach to storytelling that it rarely matters if the line between sincerity and satire all but collapses in places. Although it is clear that Whitman wants us to like the characters (and we do, at least as movie creations – whether I'd be able to spend time with them in real life without dishing out a few slaps is another matter), it's hard to know just when we are supposed to take what they say at face value, if at all. A case in point is Charlie's disappointment at Buñuel's superb The Discreet Charm of the Bourgeoisie, whose title he had mistakenly taken at face value. I had always believed this to be a cleverly written dig at Charlie's self-opinionated seriousness, but on the commentary track on the Criterion disc it's revealed to be very much Whitman speaking from the heart. Ooops. Whitman himself is most visible in the character of Tom, the outsider with a set opinion on the debutante scene who is eventually seduced by it. More condescendingly, Tom is also designed as a dig at the more cynical audience member, a not-so-subtle suggestion that any negative view of the privileged classes is easily cured by direct exposure to them (in my experience at least, the reverse is true). But there is a balance to Stillman's approach here – Tom is as likeable as he is annoying, and with the exception of the snow-white Audrey, his fellow clique members are painted with a similar blend of affection and satire. It's quite a balancing act – Nick in particular is a real tightrope walk, a self-centred and overbearing arse who nonetheless steals almost every scene he is in, in part because he repeatedly stabs at egos that desperately need bursting (that he is also delightfully played by the splendid Christopher Eigeman may also have something to do with it). In the end Metropolitan works so divinely not because of who it's about but because it is so well written, so impeccably cast (it is great to see female characters as well defined and memorable as their male equivalents), so winningly performed, so understated in its comedy, and most of all because we really do care about what happens to these people, perhaps in spite of ourselves. That we may not realise when Stillman is being serious or gently mocking is not an issue, because when a scene really scores – as with Tom and Charlie's bar conversation with a middle class professional about the inevitability of their failure as a social group – it can, as with so much of the film, be taken either way and work just as well. This review looks at both the Criterion region 1 and the Metrodome region 2 releases of the film. Both are single disc releases and have two extra features in common, which are directly compared – the other features are covered separately. Shot on Super-16, mostly at night and with often dark-dressed interiors and characters, the film must have presented something of a challenge for even the mighty Criterion, and in the end you are at the mercy of your original material. Both Criterion and Metrodome have done a very reasonable job here, with the transfers on both discs boasting equally pleasing detail, colour rendition and inevitable level of film grain. Of the two, the picture on the Criterion disc appears very slightly lighter than that on the Metrodome release, resulting in marginally better shadow detail in darker scenes. The original mono soundtrack can be found on both discs, Dolby 1.0 on the Criterion and spread over the front soundstage as Dolby 2.0 on the Metrodome. Both are clear and noise free, pretty much all you can ask of a dialogue-driven movie. On one of the commentaries Stillman tells of his inexperience with sound recording at the time of filming, but there are no obviously evident problems here. Tom Judson and Mark Suozzo's nicely judged score always sounds good. Both discs have optional English subtitles for the hearing impaired – those on the Criterion disc are more detailed in their descriptions of sound effects, music, etc. Both discs feature commentary tracks by director Whit Stillman, though on the Criterion disc he is joined by actors Christopher Eigeman and Taylor Nichols and editor Christopher Tellefson. On paper this would appear to give the Criterion disc the edge, but the reality is not so clear cut, for while the more varied input is welcome, this is more anecdotal than Metrodome disc equivalent, and if you're after factual information about the film rather than opinion and memories then the Metrodome disc is the way to go. There is quite a bit of overlap between the two DVDs, with many of the stories and much of the background detail appearing on both discs, but most are covered in more detail on the Metrodome track, and there is considerably more information on the funding and (especially) various festival screenings here. The Criterion track is still damned good, and the banter between the four is often very engaging, but the sheer volume and detail of the information Stillman delivers on the Metrodome track just makes it the winner. Both discs include the same original preview Trailer, which is framed 4:3 on the Criterion disc (2:06) and 16:9 on the Metrodome (1:59). Although the Criterion is clearly a crop, it is at least from a reasonable quality source – the Metrodome is from a widescreen original but appears slightly stretched horizontally, and is in rather wobbly shape, especially at the end. But it's just a trailer – are you really that worried? I thought not. The real difference between the two releases lies in the other included extras, such as they are. Mentioned several times by Stillman in the commentary, the Outtakes Montage (9:23) is a somewhat ramshackle collection of alternative takes, cut material and small bloopers. Of mild interest only, it is best viewed after listening to the commentary, when you'll know what to look for. Memorial (1:01) is brief tribute to line producer Brian Greenbaum, who died in 1992 at the age of just 30, and consists of every bit of footage of his blink-and-you'll-miss-them cameos in the film. Alternate Casting features unused footage of two scenes with characters played by alternative actors, with Lloyd Kaufman as record producer Allen (2:27) and Will Kempe as Nick Smith (1:52). Interesting in themselves, their value is raised by an optional commentary track on both by Whit Stillman. The only other extra feature here is actually rather substantial. Headed simply Musical Score (26:19), this is effectively the soundtrack CD (although you'll need a DVD player to hear it, of course), consisting of 17 track of music from the film, nicely reproduced and in stereo. If you're a fan of the score then you'll really appreciate this – iPod owners may wish it had been in CD format, however. If I still fail to share Stillman's affection for the bourgeoisie at play, I nonetheless delight in his skill with dialogue and character, which sixteen years on is still as fresh and sparkling as it ever was. If the Criterion disc still seems a bit pricey (it is), then worry not, as the transfer on the Metrodome disc is as close as dammit to its illustrious US cousin, and the commentary track is a real winner that alone makes the disc a worthy purchase. In the end there is only one question left tantalisingly unanswered by both discs: why has a writer and director of Stillman's obvious and considerable talent made only two subsequent films, and none since 1997? * A particularly good example of Stillman's way of ending potentially complex discussions suddenly and unexpectedly occurs here. Having proposed the term, it is greeted initially with the question "Is our language so impoverished we have to use acronyms of French phrases to make ourselves understood?" To which Charlie replies soberly, "Yes." And the conversation moves on.